The Beverly Wilshire Hotel is such an elegant place to host an event, and the grandeur of the ballroom always sets the scene for such magnificent decor photography. 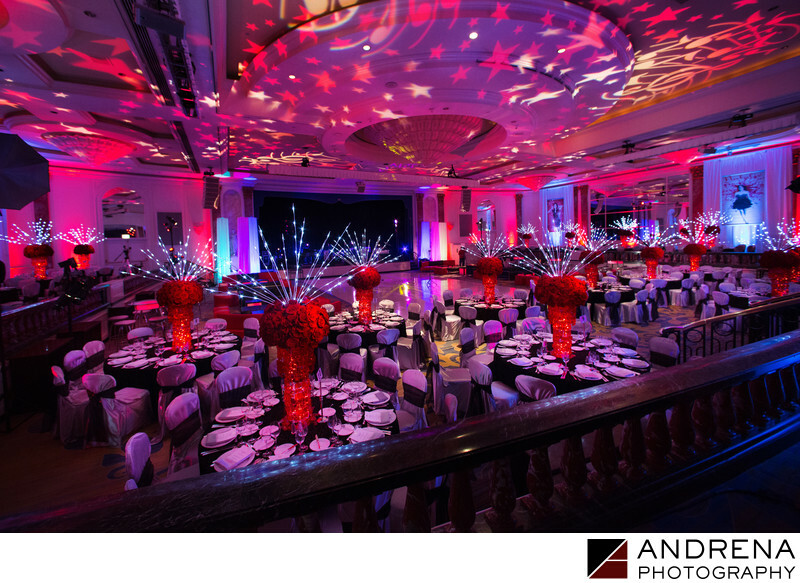 We loved the whimsical lighting of this ballroom setup for a post mitzvah service party. The points of light extending from the lush red centerpieces draw the eye upward toward a starry ceiling, both giving the place a sense of magical fun. This reception decor lent both a sophistication that thoroughly impressed the adult guests in attendance, and an imaginative party vibe that got the kids revved up for the night's festivities. The red and blue combination was particularly stunning, and the revelers at this black-tie affair had a wonderful night celebrating the mitzvah.